Global Switch 2 (London East) is Europe's largest purpose-built data centre with a gross size of over 700,000 sq ft and two incoming dedicated electrical feeds direct from the National Grid's 132 kV Network. The data centre is designed and built to an enhanced Tier III specification, delivering 45 MW of power and cooling. The facility is located in the heart of the UK's internet infrastructure, and is underpinned by a minimum N+1 standard for power and cooling systems, delivering an optimal operating environment to clients 24x7. Laid out over ten levels, Global Switch 2 was designed to the highest specifications, providing unparalleled flexibility and reliability. Being a carrier neutral data centre, EX Networks can provide multiple connectivity options including; Tier-1 IP transit, Multihomed (BGP) IP transit and direct MPLS pseudowires to a number data centres across the UK and Europe. Other services include iSCSI & Fibre Channel storage solutions, disk and tape backup solutions and a large range of colocation & rackspace options. London East sits at the heart of the connectivity-rich London Docklands giving you direct access to an abundance of global networks to meet both your commercial and geographical requirements. EX Networks can offer space solutions that meet the demands of businesses, including government organisations, financial institutions, enterprises, global system integrators, telecommunication carriers, and managed service providers. Purpose built data centre from ground up. Gross area: 705,498 sq ft.
Steel frame, concrete floors, metal faced cladding and glazing. Typical floor loading of 10kN/m2. 5m slab to slab height. 600mm raised floors with anti-static tiles. Minimum N+N redundancy on power supply. Mains power supplied via 2 x 132kV incomers. Diverse A&B supply, distributed via 11kV ring main units. 3.1MW of power per floor plate. Power/cooling systems supported by up to 33 no-break Rotary UPS sets. On-site diesel tanks (476,000 liters) support 50 hours at full capacity. 8 hour, 24x7 fuel delivery callout contract in place. Minimum N+N resilience on chilled water cooling system. Temperature in technical space maintained at 22ºC (+/-2ºC). Humidity range of 50% (+/-10%) in technical areas. Up to 25 air cooled chillers installed, supplying 1.4MW of cooling per chiller. Close control units (CCUs) provide conditioned air to technical space. Diverse chilled water distribution pipe work (ring main type) throughout facility. Fire detection system in all areas with manual break-glass units. Very early smoke detection and alarm system (VESDA). Gas suppression system using centrally stored Inergen to technical areas. Sprinklers in corridors and selected plant rooms. Dry risers to all floors. Diverse cable entry points (x4) with 110mm ducts and 32mm sub ducts. Basket trays in three-sided format to all data risers – fully access controlled. Multiple connection points to each suite. Roof space availability for satellite & antennae equipment. Tier-1 IP Transit, Multihomed Transit and Point to Point MPLS available. MPLS pseudowires to data centres across the UK and Europe. Premises controllers manage facility security 24x7. Access control using proximity card readers. Intruder alarms to all areas with external infra-red barrier. Multiple CCTV cameras (interior and exterior). Secure managed delivery and loading area. Biometric hand scanners at suite doors. Mantraps deployed at main entrance. Global Switch 2 Colocation with EX Networks is fast and simple - your hardware, our data centre. Sleep easy, knowing that the network, power and cooling requirements for your critical services are in safe hands. EX Networks offers your business an enterprise grade colocation solution for a cost effective price. Let us protect your assets from fire, flood, theft and power loss. Can't find what you are looking for? Contact us for a bespoke quote. If you need additional space, power and security, then a private rack is for you. Our full racks are all 47 units high, 1200mm deep and we can offer widths of 600mm and 800mm depending on your requirements. Whether you need a single rack, or a private cage, EX Networks can create a tailored package to meet even the most demanding setups. All racks come with dual 32 amp power feeds as standard with power densities up to 28A or 6.7kW per footprint. For our more demanding setups, we can offer custom footprint layouts with 3 phase power. EXN can offer power densities from 12A (2.8kW) up to 28A (6.7kW) per footprint. If you require multiple footprints, power can be aggregated across the racks. For equipment with ultra-high power requirements, we can offer 3-phase power. With strict access control including proximity access cards and biometric doors, you know your equipment is secure. All racks have a 3 digit combination lock for front and back access and can also be fitted with PAC access locks if required. Our fully featured EXtraNet client portal gives you remote control over your data centre estate. Securely view real time and historical power usage, reboot individual power ports, and have a single login for all power, connectivity, support and billing requirements. Unlike many colocation providers in Global Switch 2, EXN can offer 24x7 access to your rack, cage or suite via unique permanent access cards for you and your staff. This means permanent staff can visit the data centre as and when required, without prior arrangement. Business critical connectivity? We have you covered. Whether you need simple Internet breakout for your rack or a fully managed multi-site solution, EX Networks has the answer. Our ultra-reliable Cisco powered network has multiple direct connections to Tier-1 and 2 bandwidth providers, ensuring your traffic will always reach its destination via the optimal route. Our multihomed IP transit is perfect for customers requiring the best routes to all corners of the globe. EXN can provide both IPv4 and IPv6 transit, either announcing your IP addresses or providing you with a dedicated range. Whether you're implementing BGP for the first time and require an experienced managed services provider, or you're simply looking to add EX Networks to your blend, our engineers can set up, manage and maintain your sessions seamlessly. EXN can provide MPLS pseudowires between on-net datacentres, extending your network across multiple facilities. This can be thought of as a single virtual ethernet cable between your sites, providing a simple and reliable solution for your East to West traffic. Our advanced EXtraNet client portal gives you access to real time bandwidth graphs - ideal for diagnosing problems or keeping track of your usage. Check the inbound and outbound traffic levels for any of your ports, either over a daily or monthly period, with just a few clicks. Let our experienced datacentre and systems teams be there when you can't. We'll handle everything from installs, migrations and rack design to advanced troubleshooting of network and server systems. Engineers with a wealth of experience. Our 24/7 support team with industry wide certifications ranging from the network to the application layer will look after you and your data. In an emergency, our centrally located offices and engineers deployed in the Docklands on a daily basis means you can save valuable minutes when time is the most critical factor. EX Networks have helped hundreds of customers complete more complex projects, requiring services including full physical audits, rack design, project management, racks preparation, and migrations. Your services, in our cloud. 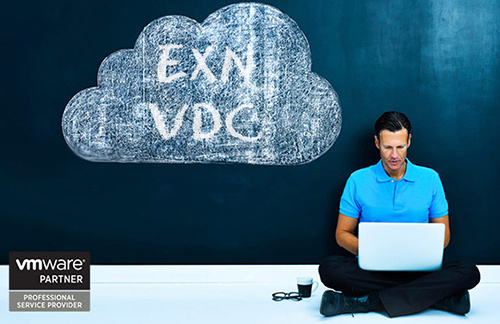 The EXN Virtual Data Centre is a scalable, fully automated and resilient enterprise-grade Infrastructure-as-a-Service solution. Customers who traditionally colocated equipment within 3rd-party datacentres can now throw away the depreciating hardware, support contracts and power bills. Our vDC lets you build, destroy and clone virtual servers with the click of a few buttons.